These wasps have been burrowing into my lawn. The lawn has a Southern exposure and is rather sandy. This is the first that I have seen or even heard of this particular wasp. I'm presuming eventually they will move on. Thanks for the photo. Yes that is a Cicada Killer wasp. A female by the looks of it. Those two large spurs at the junction of Tibia and Tarsus on the back legs are a dead giveaway. It is believed that these help the female cicada killer with digging her burrow. I am afraid that once you have these wasps in a given year, they will return next year. Their season around here in Massachusetts only lasts about two months then they are gone till the following year, when the offspring from this year will emerge from the ground as full adults to start the process all over again. 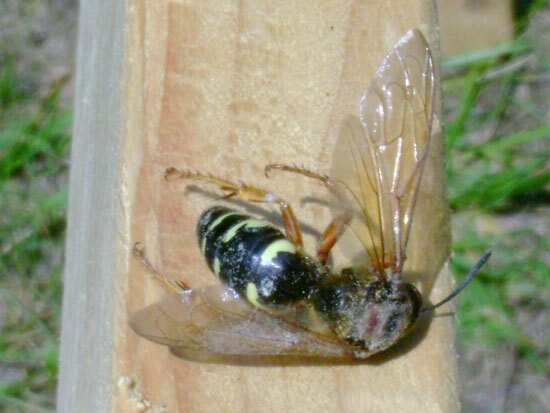 Not to worry though, they truly are a harmless wasp. They don't bother humans even when you bother them.